If you only have one day to spare, you cannot go passed a snorkel and dive trip on Illusions! The 12 metre catamaran has plenty of room to relax while your not exploring the aquatic playgrounds and fringing reefs below. Throughout the day, you will get to explore the reefs around Blue Pearl Bay, Hayman Island, and Langford Reef. Illusions also has ample deck space for sunbaking and spotting the native wildlife and has a licensed bar on board! Introductory Dive - try your first dive with our qualified diving instructor, subject to a diving medical questionnaire taken on board. Blue Pearl Bay is on Hayman Island, in the northern part of the magnificent Whitsunday Islands on Queenslands Central Coast. 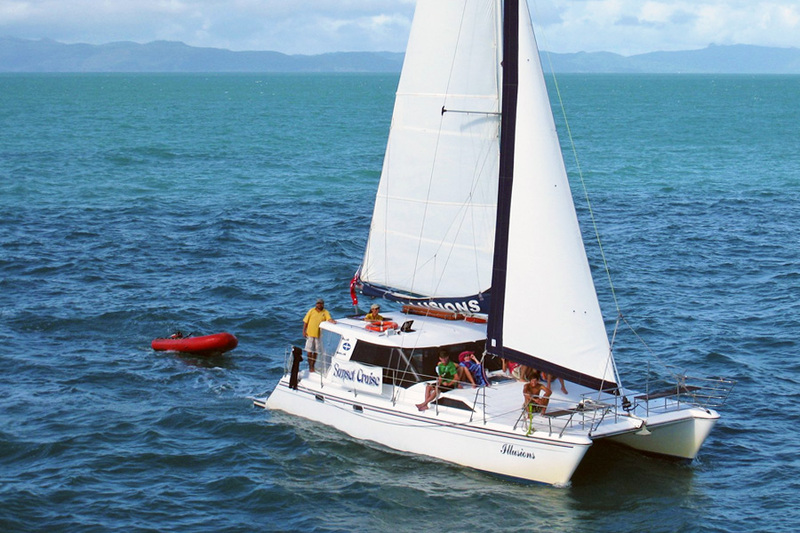 Sail and relax with Illusions as we leave Abell Point Marina at Airlie Beach and cross the Whitsunday Passage to Hayman Island. Watching and being part of the fish feeding at Blue Pearl Bay is an absolute highlight of any trip to the Whitsundays. You will be surrounded by hundreds of fish ranging in size from the smaller Sergeant Majors and brilliantly coloured Fusiliers right up to our own metre long Giant Wrasse, called Priscilla! Whether you choose to snorkel (free tuition is provided for those experiencing this for the first time) or take an introductory or certified scuba dive with our own qualified instructor, you will be delighted at the range and diversity of the coral at Blue Pearl. As is typical of fringing reefs, the range of coral is extensive, with all sorts of hard and soft corals waiting for you to explore their fragile beauty. For those not wanting or unable to venture into the water, Illusions is equipped with Bathyscopes that allow you to see the coral and fish life from above water as we float over the bay in our dinghy. Everyone that goes out on Illusions gets to see the fish and coral. Langford Island beach is actually a sand spit that stretches from Langford Island at the western side to One Foot Island to the east. It is called One Foot Island because at high tide that is about all the sand that you can see--the rest may be completely underwater. You are free to snorkel or dive again or walk along this pretty beach, with views across to Hayman, Black (Bali Hai), Arkhurst, Bird and Hook Islands and to Stonehaven. A great place to spot turtles and rays. Then it is time to head back on board for the return trip to Airlie Beach, while enjoying a magnificent buffet lunch. Please note there is a deposit if you pre-book your dives for the day of your tour. This deposit is non-refundable and does not guarantee diving during your tour. Dives are subject to change and are dependent on weather and conditions.